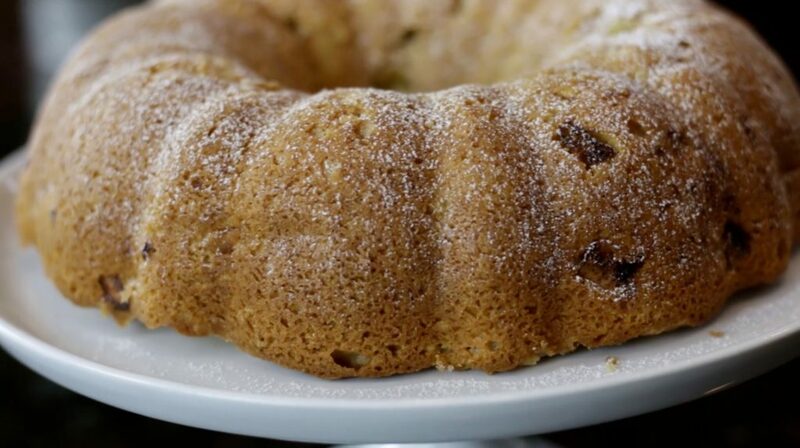 This recipe for Rhubarb Coffee Cake brings back a great memory. A few years ago my niece Rebecca, along with her family and my brother were visiting from Germany. As I was gathering my ingredients for the cake, Rebecca asked if she could help. It was our first baking experience together. That visit was a few years ago and Emma, my great-niece, was only 18 months old. She’ll celebrate her 6th birthday next month and has a younger sister, Marla, who’ll celebrate her 4th birthday in January. Unfortunately, we don’t see them very often and with two small children, they don’t come to the US – we go there. We try to visit once a year just to keep up with the girls. That year between visits is a long time at this young age and the changes in the girls are mind blowing. 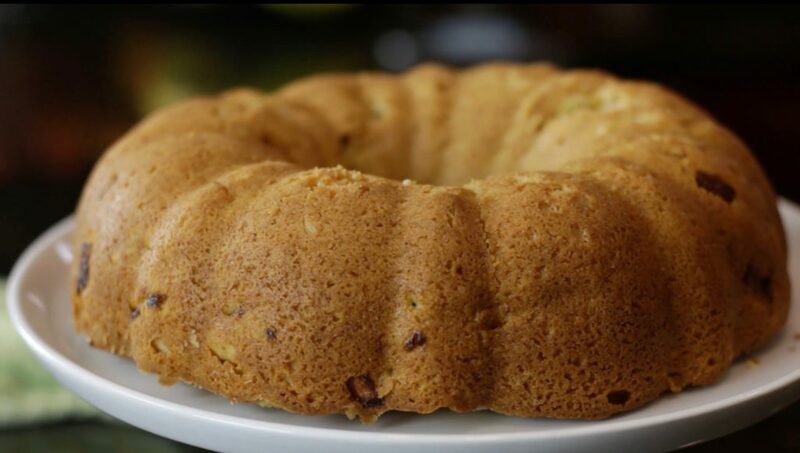 Enjoy this sweet-tart cake warm with a cup of tea or coffee! The cake can be made in advance, frozen, thawed overnight and gently warmed in the oven or microwave. It’s a great recipe to keep on hand for unexpected company, or for breakfast on a holiday morning when you already have a long list of cooking tasks. Watch the Rhubarb Coffee Cake video here. This Rhubarb Coffee Cake is moist, aromatic and delicious. Serve warm or room temperature. Make a batch of strawberry ice cream (see my book Endless Summer) to serve on the side. 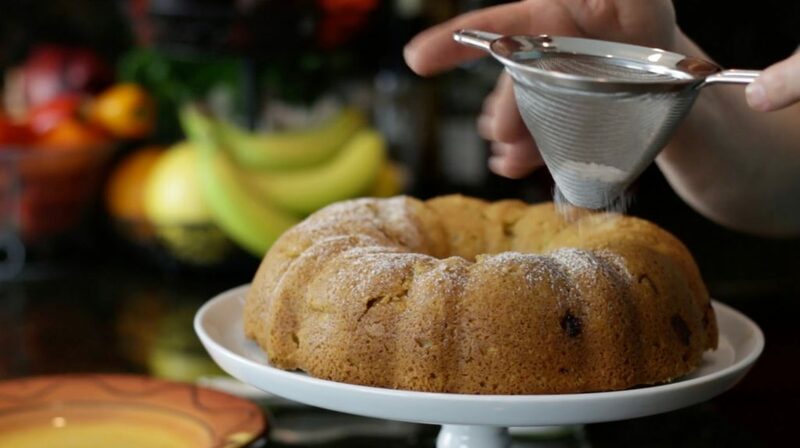 If using the powdered sugar, sprinkle over the cake just before serving; it dissolves quickly. Preheat the oven to 350 degrees F and rease a 9-inch angel food or spring-form pan with butter. Place the butter in an electric mixer fitted with the paddle attachment and beat until smooth, scrapping the sides and beater as needed. Add the sugar and salt and beat until fluffy, scrapping the sides and beater as needed. Add the eggs and vanilla and beat on medium high until incorporated, scrape the sides and beater a couple of times until everything is combined. Don’t worry if it looks a little curdled it will smooth out. Add the flour, baking powder, cinnamon, baking soda, cloves, ginger and nutmeg, mixing on low until the dry ingredients are moist. Scrape the sides and beater and mix in the sour cream until thoroughly blended and the batter is smooth, scraping sides and beater as needed. Toss in the rhubarb and mix until well incorporated. Pour the batter into the prepared cake pan. Sprinkle the streusel topping over the cake and bake in preheated oven for 45 minutes or until cake tester comes out clean. Cool for 10 minutes. Loosen sides before removing the cake to a cooling rack. Cake freezes well. Cool completely and wrap tightly.